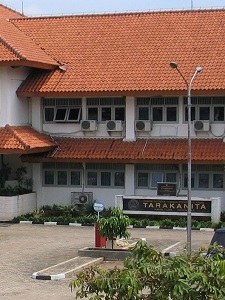 The Tarakanita School of Communication and Secretarial Studies is basically a girl educational institution committed to the empowerment of young women through vocational and academic trainings. In celebrating our golden (50th) anniversary this year, we are hosting a variety of academic and non-academic events. Our academic calendar includes international conference held in our Thamrin City conference room, Central Jakarta As we are celebrating a half century of our existence in an era characterized by new developments in vocational educations, advancement of Information and Communication Technology, and global environmental issues, the conference will provide a room for exchange of ideas concerning topics relevant to the gender educations, vocational trainings, Information Communication Technology, and global environment. We do hope to welcome international institutions and academic communities to submit their papers. Indicate your proposed conference cluster and specific stream in the subject line of your email. abstract should not be more than 300 words. The font is Times New Romans with 10 pts. Those who need printed proceeding should order in advance by email to ICBC2018@starki.id. The price is IDR 300,000. Please take note that the deadline of conference payment will be on or before July 20, 2018. This will give us enough time to make the necessary preparations for the venue, and all other pre-conference arrangements. Kindly send to my email address the scanned copy of your receipt upon payment. The ICBC will protect your personal information. Your personal information received will only be used to fill your order. We will not sell or redistribute your information to anyone. The registration fee received by ICBC is not refundable. If you have mistakenly paid more than required, we will refund the extra amount paid within 30 days. The transaction charges will be deducted while giving refund. Please clearly mention the name of author and paper title on payment invoice and email the scanned copy of payment receipt to ICBC2018@starki.id. By submitting your paper, you agree, that if your paper gets selected you will register and present the paper. All co-authors attending and/or presenting at the conference must register too. The abstracts/papers will also be submitted to reviewers nominated by their respective authors for its non-blind review. The author(s) of each submitted extended abstract should nominate at least one reviewer. Acceptance of a submitted paper will be based on both kinds of reviewing. The selection of the best 25%-30% papers, will also be done based on both kinds of reviewing. Final versions of all accepted papers, extended abstracts, and short abstracts that have at least one of their authors with a confirmed registration status in the conference will be included in both versions of the conference proceedings (hard copy and CD). Our address is just 300 meters from Hotel Indonesia (HI) roundabout. The purpose of this document is to provide you with General Guidelines for giving an oral presentation at the 2018 International Conference on Business and Communication (ICBC2018). The size of a session can vary depending on the conference. A session may include 5-8 speakers. All speakers are expected to be present at the time their session begins, and to remain for the entire session. You should arrive 5-10 minutes before the scheduled time of presentation to meet with the session “moderator” who will confirm that you are present. Again, the maximum length of your presentation is 15 minutes in length with 5 minutes for questions. Your moderator will signal you a few minutes before your talk should end. If you try to go over the maximum time allotted, the moderator will end your talk by interrupting you to announce that your time is up. Since your time is limited, and your research topics are substantial; and since you want to transmit as much useful information as possible; preparing your talk requires careful planning. You must step back from the intimate detail you have been immersed in during your research and see it in its totality, with everything in proper perspective. Note that an oral presentation is different from a written presentation. The oral presentation is like the Abstract, concise and to the point. It is advised that you to give one or more practice run of your presentation before doing it in public. Begin in a room by yourself. Set a timer. Stand up in front where you intend to stand. Have whatever notes, props, illustrations you need ready and in position. Then give the presentation as if the room were full. Imagine people sitting out there looking at you. Look them in the eyes. Imagine yourself in the audience watching you give the talk. Do it several times. Try also to give the talk before a friend who will honestly critique your presentation. Giving a talk to an empty room may feel strange, but giving it in a room with someone else there is even stranger. We look forward to your participation of this program. We hope to meet you in the conference and to enjoy the beauty of the central city, Jakarta.